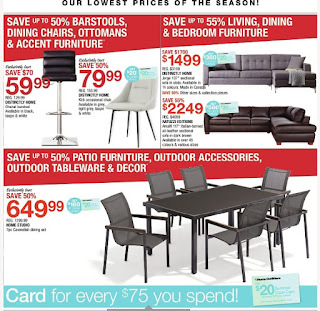 Home Outfitters Furniture June 1 - 7, 2018 A lot of good deals from the latest Home Outfitters Furniture flyer this week. 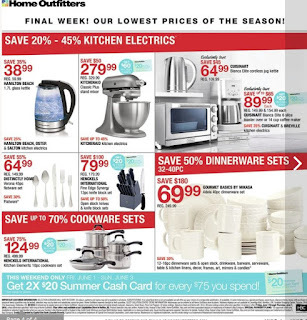 Also, save with coupons and the latest deals from Home Outfitters. Distinctly Home Chanel Barstool $129.99 Regular Price $59.99 Sale Price $70.00 Savings Available in black, taupe & white. Distinctly Home Kirk Occasional Chair $159.99 Regular Price $79.99 Sale Price 50% Savings Available in grey, light grey, taupe & white. Get $20.00 in cash cards. Distinctly Home Jorge 107" Sectional $3199.00 Regular Price $1499.00 Sale Price $1700.00 Savings Sofa in slate. Available in 14 colours. Made in Canada. Save 50% other sizes & collection pieces. Get $380.00 in cash cards. Amalfi 117" Italian-Tanned All-Leather Sectional $4999.00 Regular Price $2249.00 Sale Price 55% Savings Sofa in dark brown. Available in over 45 colours & various sizes. Get $580.00 in cash cards. 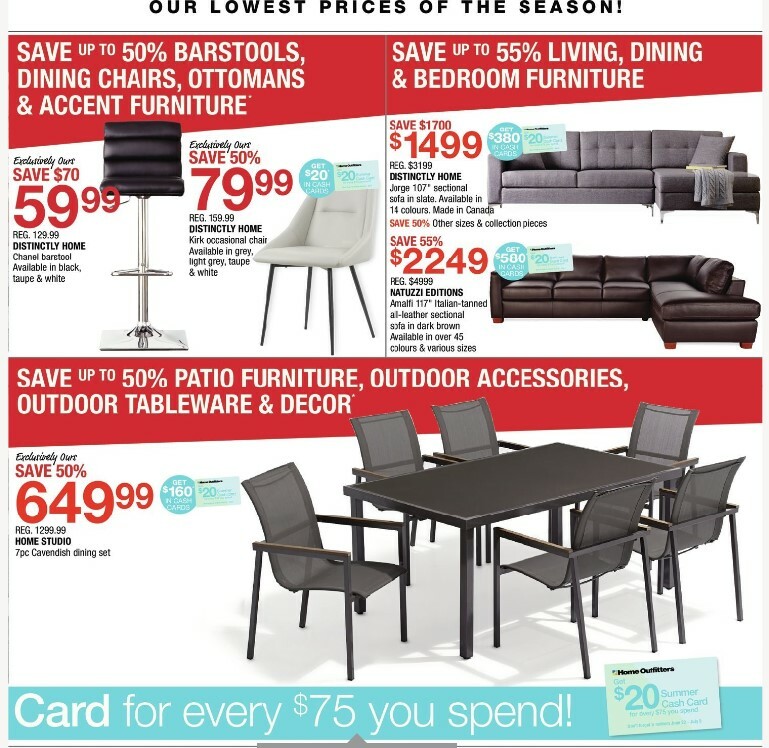 Home Studio 7PC Cavendish Dining Set $1299.99 Regular Price $649.99 Sale Price 50% Savings Get $160.00 in cash cards. 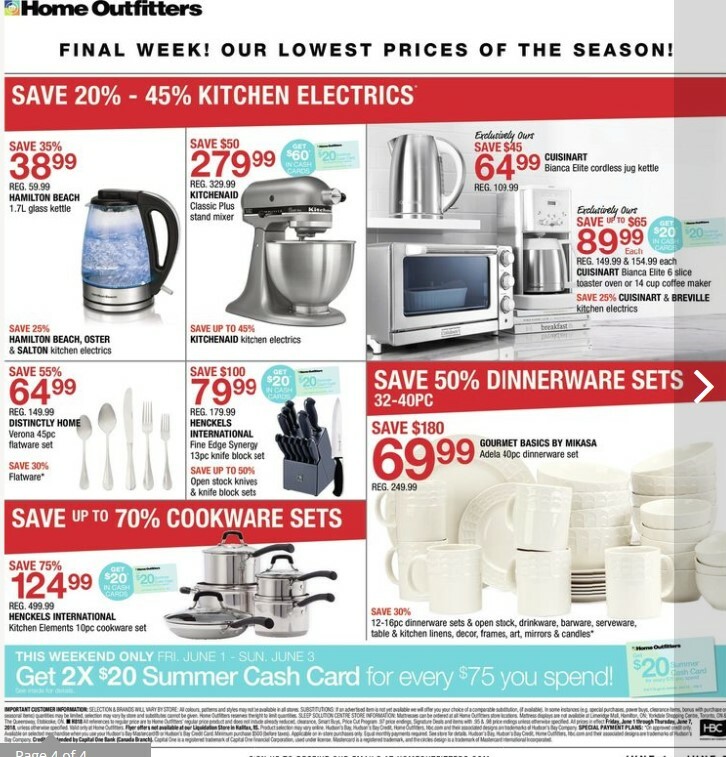 Don't miss the Home Outfitters Flyer Deals and more category & offers from the Home Outfitters Canada valid June 1 - 7, 2018.